It’s that time of year when all the my baking instincts come out in full force, and with that ambitious nature some of the brands that we all have known and loved for year spend lots of time on my counter. McCormicks has been a household name for decades and they are sharing some cooking love with us in the form of a baking kit, and I know we could all use some new spices. Trust me, I just looked in my baking cabinet, and it’s not a pretty sight. I am off to do some house shelf cleaning in honor of this giveaway. I have a few traditional cookies that I make every year, but I haven’t really settled in on a ton of keepers. 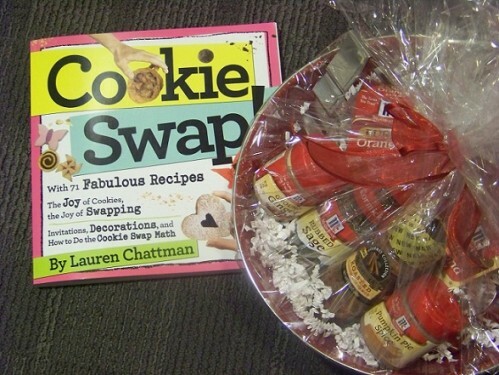 This Cookie Swap book is my answer because there are SO many fun recipes to choose from. I would love for my girls to master a few themselves, so they have fond memories of always making the same cookies with me year after year. as well as an interactive cookie recipe spot on their site. I just spent some time browsing the facebook page and so many great cookie ideas and tips are being shared. What a perfect and free addition to tonight’s schedule. So what will one lucky winner receive? A gift basket filled with goodies from McCormicks. 1. Comment – What is your favorite Christmas Cookie? Entries for this giveaway will close on Monday, Dec. 12 @ 3p EST. The winning entry will be selected via random.org. The winner will be contacted directly and must respond within 48 hours or a new winner will be selected. This giveaway was sponsored by McCormicks as part of Win Giveaways Holiday Bash. This Post was written by me and was not edited by the sponsor. Read more on my disclosure policy. Terms for this giveaway are located on the Win Giveaways Facebook page. My grandma’s sugar cookies are my favorite. My favorite christmas cookies are the cutout sugar cookies decorated really cute!!! I subscribe on Google Reader! I love your site! My favorite Christmas cookie is a Peppermint Molasses cookie. I subscribe on Google reader. My favorite Christmas cookie is cake mix cookies. They are easy to make a lot of to give as gifts! Spice cake and red velvet mix make particularly festive ones. oohhh good giveaway! There’s not many cookies I don’t like, but I’m a huge fan of oatmeal chocolate chip cookies! Also, I know this isn’t a cookie, but its a tradition in our family to have potato candy. Yum! My favorite Christmas cookies are Monster Cookies or Sugar Cookies! My favorite is a good ole sugar cookie with frosting. Yum! I subscribe to you and love it! Cut out sugar cookies with buttercream frosting! I love to make homemade Scottish shortbread from a recipe my Scottish neighbor used when I was growing up. butter, sugar, flour, yum… If someone else is making them, I love pitzelles too. My favorite cookie…Butterscotch Cookies w/Burnt Butter Icing. Yummy! my favorite cookie is chocolate chip – simple but yummmy! I like Frosted Sugar Cookies that are chewy! I have yet to meet a cookie that I have not liked! My favorite cookie is the Christmas cutout Apiece cookie. I follow your blog via GFC & Google Reader. My favorite cookie is The Christmas cutout Apiece. I love any Christmas cookie with chocolate! My favorite cookie is like a soft oreo cookie. I think they are called Holiday Sandwich Cookies. You make them with Devil’s Food Cake Mix and then they have cream cheese frosting inside. I love my grandmother’s sugar cookie recipe. It has a cake-like quality. My favorite christmas cookie is my grandmother molasses cookie. I can remember eating them when I was a little girl and have never found a recipe quite like her’s. She would always decorate them for us and they were the best. My favorite Christmas cookie isn’t really a cookie but my grandma’s cherry mash! Sugar cookies are my favorited. The kids have fun icing them and putting way too many sprinkles on them. Thanks for the giveaway! My favorite Christmas cookie is sugar cookies with icing and sprinkles that the kids gob on! Cut out sugar cookie with icing. Simple but yummy! I think my favorite Christmas cookies are Peanut Butter Blossoms, you know the peanut butter cookie with the Hershey Kiss on top. My favorite cookie is Peanut butter Blossoms. So yummy! My favorite Christmas Cookie is Peppermint Bark. My absolute favorite cookie anytime of year is a warm chocolate chip cookie…YUMMMMM 🙂 Thanks for the giveaway! My favorite Christmas cookies are Candy Cane Kisses! My favorite Christmas cookie is the sugar cookie but cut into holiday shapes with a cookie cutter! and I get your emails 🙂 Thanks for all that you do! Every year my daughters and I make chocolate “gingerbread man” cookies which we decorate with sprinkles, candies, chocolate chips, etc. It’s a fun tradition! My favorite cookie is thumbprints with raspberry jelly. I’m an email subscriber. I love the sugar cookies that are made with confectioners sugar. YUMMY !! I subscribe to your site in my feed reader. I love snickerdoodles — does that count as a Christmas cookie? #1 My favorite Christmas cookies are Candy Cane cookies. YUM! #2 I added you to my “Likes” on FB. #3 I subscribed to your emails. Sugar cookies that are frosted and decorated are a favorite at our house. My favorite cookies are sugar cookies! My favorite Christmas cookie is the standard decorated sugar cookie. I love decorating them with my little man. Gingerbread cookies is my favorite holiday cookie! My favorite Christmas cookie is a press cookie that we make during our family Christmas goodie bake day. 🙂 Yum! My favorite Christmas cookie is Mrs. Hanes’ spice cookie (often called Moravian cookies). Of course, I live in Winston-Salem NC and they are very popular here! My favorite Christmas cookie is a butter spritz cookie-butter enough said. my husband loves for me to make him snickerdoodles for Christmas!! Favorite Christmas cookie are thumbprint cookies. Love to make them with my grandsons using their thumbprints and then topping with Hershey Kisses. Mmmmm…….good! Sugar cookies are the best at Christmas! Thanks for the entry!! I love making almond cookies and a candy cane cookie too…there are about 5 I make every year. I love plain old sugar cookies with a lot of icing! Good old stand-by: Toll House Chocolate Chip!!!! I am a friend on the Facebook! Hooray. Sugar cookie decorated with bright Christmas colors! I follow with google reader friend connect. Peanut Butter Blossoms are my fav holiday cookie! Sugar decorated cookies with icing are my favs! I love soft and chewy sugar cookies. I am a google rss subscriber. Ding Bats,,full of date and coconut goodness! cut outs if somebody else is making them!! or pecan tassies if I’m the baker! Definitely sugar cookies. We only make them once a year, so they’re special to me. Perfect with afternoon tea! My favorite holiday cookie is called Fruitcake cookie, it is soooo good, really. I like Sandbackels. They are a Norwegian butter cookie shaped like a little cupcake wrapper. Yum! A simple frosted sugar cookie wins for me! Snickerdoodles are my absolute favorite– my mom used to make them every Christmas. My new favorite is Double Chocolate Peppermint cookies. Delicious! I love sugar cookies. They’re just so easy and versatile, you can cut them in any shape, decorate them however you want, get the kids involved. But I especially like to eat them right out of the oven, when they’ve just barely cooled enough not to burn your tongue! I know this isn’t really a cookie, but one of my favorite sweets for the holidays are white chocolate covered pretzels! Favorite christmas cookie is gingerbread! My favorite are candy cane cookies! I’m your friend on facebook, too! Yes oh yes. Thank you for entering me. I LOVE oatmeal raisen and hubby is anything chocolate. Oatmeal cranberry walnut are my favorites. I tweeted about the contest on Twitter. I subscribe through RSS. Since I am now Gluten Free, my favorite cookie is peanut butter. My favorite Christmas cookie is the rolled out sugar cookies that are iced and decorated. I love Polvorones, which are pecan balls rolled in powdered sugar and cinnamon. I like Peanut Butter Blossoms, Peppermint Candy Canes, Raspberry Thumbprints and cake like Chocolate Chip Cookies! Thank you for giving us the chance to win this wonderful give-a-way! I’m also a follower on facebook! My favorite are sugar cookies. I love peppermit candy cane twists! My favorite Christmas cookie is a Cranberry Cookie. Yummmm! Our family loves to make the traditional sugar cookies we cut out, bake then decorate ourselves with icing, sprinkles and candy. It is a wonderful family time project. I love following your posts in google reader! My favorite cookies are Pumpkin Chocolate Chip – made a batch yesterday. Need to take some to the neighbors before I eat them all. I subscribe by email. Sugar cookies – rolled, cut out as trees, stars, bells, and holly leaves and decorated. My favorite Christmas cookie is still the good old sugar cookie cutout! So much fun to make with my kids! Snickerdoodles are my favorite cookie. I love sour cream drops! You can’t taste the sour cream but are so good! Yum! I love cookies! My favs are Paula Deen’s chocolate gooey butter cookies (recipe up on my blog on Wednesday) and my grandmother’s chocolate chip cupcakes (recipe coming on the 21st). My favorite Xmas cookie is my all time favorite cookie anyway, peanut butter cookies. Can’t be beat. I will love the cookie give away. I subscribe through Dashboard. My favorite holiday cookie is sugar cookies because my grandma always had a huge batch for us to decorate each Christmas! I subscribe to your feed through my Google Reader. Nothing beats gingerbread cookies. And my recipe takes LOTS of ginger – this is a great giveaway! i just made u my friend on face book. my favorite cookie of all time is nut balls. love powdered sugar!! My favorite is Sugar Cookies. It’s something about the frosting. Plus, it always reminds me of making cookies with my grandma! My favorite Christmas cookie has to be the sugar cookies I make every year with my kids. They are so fun to decorate and taste delicious too! I love Peanut Butter Munchies! my favorite Christmas cookie is the No Bake Cookie. For a cookies, I love just plain sugar cookies. My fave treat is peppermint bark though. and I liked your page on facebook 🙂 thanks for doing this! My favorite cookie is the Thumbprint cookie. It has a lot of other names but it’s the peanut butter cookies with a chocolate kiss in the middle. A favorite of ours are frootloop cookies. They are very simple yet very yummy! My favorite cookie is the old fashioned sugar cookies with icing that we made when I was a kid. I have made them every Christmas for as long as I can remember! Thanks for the great giveaway! I love peanut butter blossoms especially if you eat them right after they come out of the oven! Sugar cookies with lots of frosting are always good too! Soft sugar cookies with thick icing! My favorite cookie is oatmeal macaroons. I love buckeyes (chocolate/peanut butter deliciousness)! My favorite is the peanut butter cookies with heresy kiss on top. Subscribe to your emails! YOU ROCK! I think my favorite Christmas-type cookie is a Soft Molasses Chew. I’ve even tried them with chocolate chips! Yummy! My favorite cookie is the sugar cookie with icing! I love kolaczki cookies. I might make some tonight. Subscribed to your google reader. I love the peppermint candy cane cookies that my mom used to make…good memories. My favorite christmas cookies are snowballs. I love snowballs (mexican wedding cakes)! My favorite christmas cookie is oreo balls- can’t wait to make them! My favorite cookie is a regular ole sugar cookie with frosting. My all-time favorite is so good that I make them all year – why wait? They’re called “Chocolate Ecstacies” and they’re all that the name implies! For over 30 years our family cookie has been a Jewish pinwheel cookie – wonderful dough of sour cream, cream cheese, butter and flour with a nut, cinnamon, orange zest and sugar filling. It’s our favorite! My favorite Christmas cookies are the ones I cut out and decorate with my two daughters. We have a lot of fun and they are yummy too! Just subscribed to your site by e-mail! Another entry! My favorite cookie at Christmas is the Snickerdoodle. My favorite Christmas Cookie – Molasses Cookies! I am a FB friend of B&B. I love to make gingerbread men cookies and need spices to do that. Would love to win. I subscribe to your blog via Google reader. love it. Ooo, I love Buckeyes too. For whatever reason they were always a holiday treat in my house. I love to make sugar cookies with the kids!! Yummy! I love peppermint flavored sugar cookies! I could so use some new spices. Some of mine are so old they probably don’t have any flavor left. My favorite cookie is homemade mint thins!!! Delicious!! My favorite is peanut butter and jelly “jammies”! Hmm, just one favorite cookie? I am a huge fan of the classic peanut butter with a kiss in the middle. Can’t go wrong with that one! I love a good gingerbread cookie. Gingerbread Men cookie are my favorite. Like Balancing Beauty and Bedlam on facebook. My favorite Christmas cookies are cut-out sugar cookies complete with frosting and sprinkles. They are great! My grandma always made simple shortbread cookies at Xmas and they were the best! I tweeted this great offer. My favorite Christmas cookies are the traditional cut-out cookies. I love a christmas sugar cookie – all decorated and sparkly! The traditional peanut butter/chocolate kiss cookie is my favorite. Hershey kiss and peanut butter!! My fav christmas cookies are snowmen sugar cookies! I’m a fan and friend of your facebook page! My favorite cookies are peanut butter with a candy kiss on top! My favorite Christmas cookie is a lump o’ peanut butter covered in chocolate. We call them Buckeyes. These things are addictive. My favorite Christmas cookies are homemade and hand decorated sugar cookies! I love my great grandmother’s tea cakes. The cut out Sugar Cookies that my Mom bakes. Peanut butter kisses (peanut butter cookies with a hershey kiss pressed into the middle)!!! I love my sweet Mum’s recipe for Cherry Flips – a bright red bit of cherry wrapped in shortbread and drizzled with a sweet almond icing! YUM! I do so enjoy your e-mails! I love my aunt’s sugar cookies! I friended your page on facebook. I’d have to say my favorite Christmas cookies would be simple ‘sugar cookies’. My daughter and I have so much fun in the kitchen making and decorating them together every year. The rest of the year we usually do choc chip or peanut butter cookies! ginger snaps or monster cookies. I love Buckeyes for Christmas…a cookie/candy all in one! My favorite cookie is a cranberry noel. It’s a dried cranberry and pecan shortbread, so YUM! Oatmeal raisin are my favorite! I like so many. One would be Stauffer’s Star cookies (dark chocolate). alexandrarosewahm at gmail dot com is an email subscriber. My favorite cookie is Russian tea cakes. My favorite cookies are gingerbread cookies. I have this old traditional scandinavian recipe I make every year. My favorite Christmas cookie is…spritz cookies! My favorite Christmas cookie is my grandma’s recipe for Cream Wafers with pastel frosting in the middle–YUM! I follow you on Twitter and tweeted your givaway! Ohh…I love short bread cookies. I LOVE making decorated Christmas sugar cookies with my kiddies even more! I love spending time with them, and what a great way! In the kitchen making yummy treats! I love making and decorating sugar cookies with my boys. A family favorite around here is my husbands homemade chocolate chip cookies. ALL the family requests them and friends too. They have a special ingredient that makes them stay soft and they are soooooo yummy!!!! FAv Christmas cookie here is the Hershey Kiss Cookie. Facebook follower! Love sugar cookies! My favorite is Scottish Shortbread. I love sugar cookies at Christmastime! I like your site on Facebook too. my grandma, who has passed on, always made the really great date bars. i could never get enough of them. I love Iced Carrot Cookies. Sweet crunchy with a hint of lemon. YUM. My favorite Christmas cookie is a Spritz cookie. Yum! I would have to say that my favorite is Russian Tea Cakes. I only make them at Christmas time and they are oh so yummy!!! My favorite are whatever ones I make with my little girl 🙂 Mostly frosted sugar cookies! I love decorated sugar cookies made by the kids! There are so many cookies I like; it’s funny how some flavors only show up during the holidays. Probably (crisp) sugar cookies are my favorite. Thanks for the giveaway. My favorite are these wonderful white chip cookies I make with orange zest, yum! Any kind of sugar cookies. My favorite cookies are pumpkin spice. My favorite cookie is the peanut butter one with the hershey kiss on top! I follow you and tweeted this giveaway! My favorite Christmas cookie is Gingerbread. Friend/Like Balancing Beauty and Bedlam on FB! We love peanut butter cookies! My favorite Christmas cookie is chocolate dipped oreos. My favorite Xmas cookie has to be the meringue with pecans. We call them Divinity. My favorite Christmas cookie is the peanut butter and hershey kiss cookie. I don’t know the name of it, but I love it! My favorite cookie is my Mom’s chocolate chip! Russian tea cakes or PB blossoms. My favorite cookie that we make is the Ice Cream Cookie….very flaky dough YUM! Mmmm… good ‘ole fashioned Frosted Sugar Cookies are my faves. Chewy and “tough” … YUM! Thanks for the giveaway fun! I love to make Russian Tea Cakes, they just melt in your mouth! Peanut Butter w/ Hershey Kiss! I subscribe to your blog by email and love it! I love to make chewy chocolate-peppermint cookies! I get updates to your blog via’ email! My favorite Christmas cookie is hard to narrow down… probably Church Windows, which my mom made every year. I am a Facebook fan and I like all kinds of cookies. Oatmeal cookies are my favorite. My favorite is decorated cut out cookies. My favorite Christmas cookie is plain sugar cookies decorated with colorful icing. My favorite cookie? Have I ever met a cookie I didn’t like at least a little bit? Love oatmeal chocolate chip cookies hot from the oven with a mug of milk. I love gingersnaps, too, the soft drop kind. With coffee. Is it any wonder that my clothes are tight? I love cookies. my favorite christmas cookie is the gingerbread cookie! i already subscribe to your email an follow you on twitter! I subscribe to your daily email. I love sugar cookies decorated with fancy sugars! My mom would make M&M cookies every Christmas, and they were my favorite. Now I pass that cookie along to my family each holiday season! My favorite cookie is the sugar cookies because you can always make them into so many shapes and designs. We like Sugar Cookies, this time of the year. Mine has always been my moms raspberry bars. YUM!!! I love decorated sugar cookies, mostly because it’s a family tradition and we always come up with some of the SILLIEST ways to decorate! I subscribe to your blog in email. ALL Christmas cookies are my fave … I do love the ricotta cookies I make each year, but I also love an old-fashioned frosted sugar cookie, too. I love the old fashioned sugar cookie with lots of sprinkles! Our familes all time favorite cookie is a basic sugar cookie with frosting and sprinkles made by the kids of course. I love seeing their color choices and all the sprinkles they can pile on there. Our family follows you on email updates. Thank you. I like Peanut Butter Blossoms. My favorite X-Mas cookie is Cocoons! Like Beauty & Bedlam on FB! Mollasses (sp) cookies are my favorite. My favorite Christmas cookies are thumbprints and buckeyes! I subscribe via daily emails. Frosted Sugar Cookies are my favorite. Shortbread – butter, flour, sugar. I totally enjoy Amish sugar cookies with sprinkles. Just a simple, sweet treat to savor. My favorite Christmas cookie is just a plain sugar cookie with icing and sprinkles in the form of a Christmas tree. I friended your fb page. It is too hard to pick a favorite there are too many yummy kinds! My favorite Christmas cookies are sugar cookies! I love classic chocolate chip! I love the snowman shaped sugar cookies. I just made my new favorite Christmas cookie this weekend! It’s a molasses cookie with a thin frosting and peppermint sprinkles. Yum!!! my favorite christmas cookie is the pb ones w/ the hershey’s kiss! Do I really have to choose a favorite cookie? There are so many! I love Picky Palate’s Oreo Chocolate Chip Cookies. They are heavenly! I’m a subscriber (google reader). i like cranberry pistachio cookies. so festive. I love classic sugar cookies! My favorite Christmas cookie is a simple, frosted SUGAR COOKIE. My favorite Christmas cookie is peanut butter w/the hershey kiss on top! I love a chewy oatmeal cookie! I subscribe to your updates by email. My favorite Christmas cookies are Cowboy Cookies! I love the simply chocolate chip (homemade of course). When I was young, an elderly neighbor always brought over Parisewafers at Christmas time. They are still my very favorite cookie! My favorite Christmas Cookie is a Classic Soft Frosted Sugar Cookie. chocolate or sugar … yum! We do the cut-out sugar cookies and decorate them. My favorite is Gingerbread cookies. I love the lemon drops my mom makes during Christmas! I love my sugar cookie recipe that has an almond-flavoured icing to spread on it. My favorite is a sugar cookie with frosting and sprinkles. Brings out the kid in you at Christmas! I love me some Sugar Cookies! I love the traditional sugar cookies! I like chocolate oatmeal cookies. I subscribe to your post by reader. only a small area of the jam filling. It is delicate and quite beautiful. I’m a subscriber. Pick me, pick me…what a yummy giveaway! My favorite Christmas cookie is a chocolate cookie with a peanut butter center. Everybody loves them. I subscribe by email. Its not Christmas without my favorite – Farmhouse Mint Cookies – a recipe from an old friend that became a family staple! My favorite christmas cookie are the ones with a peanut butter sugar type cookie on the bottom with a chocolate kiss on top! My mom’s chocolate meringues. I need to figure out how to make them myself! Sugar cookies and decorating them with sprinkles. I follow via twitter @michellemonks34 and I tweeted about this great giveaway! My favorite Christmas cookie are the Magic Cookie bars my dad used to make every Christmas!! My favorite Christmas cookies are rosettes covered in powdered sugar. My favorite cookie is Pecan Tassies. We like to make sugar cookies with TONS of sprinkles on top. I subscribe to this RSS feed. I make new recipes every year, but I rely on the ol’ chocolate chip! My favorite is sugar cookies- especially the shortbread ones that come in the tins! My favorite cookies are Cherry Oatmeal Cookies! I love plain old Sugar Cookies! I love all Christmas cookies! My favorite would probably decorated Christmas cookies. Another favorite of mine are peanut butter blossoms. my favorite cookie isn’t a Christmas cookie, but it is a pudding chocolate chip with walnuts (no flour)! Wonderful! I love love love ginger snaps! My favorite cookie is the Neiman Marcus cookie, but I also love snickerdoodle this time of year. I make a white chocolate cranberry cookie that is so good it is a wonder there are ever any left for anyone else! Traditional sugar cookies iced and decorated. Chocolate crinkles are my very favorite! I love my grandmother’s Imperials. It’s not really a cookie but my favorite holiday treat is a pumkin roll. any cookie that is homemade! Family recipe called ‘goodie cookies’ – tasty wafers with/without icing. Just the good old fashioned sugar cookie with a LOT of homemade frosting! Favorite cookie is a hard one – probably oreo balls. Frosted shortbread, spritz, and Mexican Wedding Cakes – sorry, I couldn’t pick just 1. I just love cookies. If had to choose one it would be disappearing cookies. They a chocolate, with some kind of chocolate chips in them. My favorite Christmas cookies are those good ol’ gingerbread men! My favorite Christmas cookie is just the basic sugar cookies I make and decorate with my son! It is so much fun! Turtle cookies that my mom bakes! mmm cookies my favorite is dark chocolate + peppermint. I also loooove toffee and walnuts 🙂 DEEEELICIOUS! I like the basic sugar cookie with icing! I love seven layer cookies, a tradition in our home. I love lemon cookies (make from a cake mix) and butterscotch gingerbread cookies. We enjoy Brown Sugar Blossoms, Brownie Kiss bites and Cut-out Sugar Cookies! Snickerdoodles…is that a Christmas cookie…I don’t know but they are yummy! I love my moms gingerbread cookies…they are so soft, yum! I love Spritz and Russian Tea Cakes! my favorite cookie is peanut butter! Snickerdoodle cookies are a favorite for me! I have now added you on Facebook. I also subscribe to your RSS. Decorated sugar cookies. Yummy. I would love to win. I hope I do. I am an email subscriber. I love your emails and deals. I like you on facebook. Hope I win. Thanks for offering this great giveaway. My favorite Christmas cookie is the sugar cookies that I can cut shapes out with my children. So much fun! We like lots of different types of cookies. One of our favorites are chocolate cookies, with white choc. chips & pecans. Wonderful. I Love Snickerdoodles and Gingerbread cookies. My favorite Christmas Cookie are almond stars that haveraspberry jelly in the middle. My favorite is called a rosette. You use a cookie iron and fry this light batter and then dust them with powdered sugar. I like the peanut butter ones with kisses in the middle! The thumbprint cookie with the kisses in the middle. I am a fan of Balancing Beauty and Bedlam via email! My favorite is Pecan Butter Balls! My favorite is Christmas Sugar Cookies. They are the best baked with the help of my Mom and my Sister. Since my favorite cookie is whatever my mother bakes, I’d give the set to her. I like chocolate chip cookies best, any time of the year. I have a pan for making them in gingerbread shapes for Christmas though. This is my favorite cookie recipe. My favorite Christmas cookie is Hershey Kiss Cookies. I just love chocolate chip cookies… i know they are an any time of year cookie, but still! I love making sugar cookies to decorate this time of year. I like a good sugar cookie at the holidays. I love cracker toffee. It’s easy and everyone likes to eat it. Ilove simplesugar cookies that the kids get to decorate! I like decorated sugar cookies for Christmas. My favorite Christmas cookie has to be a haystack… not exactly a cookie but its my favorite! My favorite is chocolate/chocolate mint. This year my favorite cookie is the Molasses Spice Cookie by Martha Stewart. It is so easy and yummy!